Life has been BUSY. Busy but so so so so so so good. I'm breaking the long silence with one of my favorite recipes lately. A good friend of mine in Chicago made this salad for me in May and I've been doing a version of it ever since. She's an amazing person. The kind of person that you meet and instantly feel like you've known forever. She's got such a warm and inviting energy and she's weird. Weird in the best possible way. This salad is such a great expression of how I see her because it mixes some usual suspects with some things I wouldn't think to put into a salad. She's the kind of person that just makes you happy to be around and is always surprising you with her endearing quirks. When she first made it for me I was nervous. She combined some of my favorite ingredients with some things I thought I didn't like/wouldn't like together. The salad didn't really make sense in my brain but I went with it. Because I was her guest and because I'm always open to new food combos. I'm so glad I was too because it made me a believer that raw kale can be tasty. 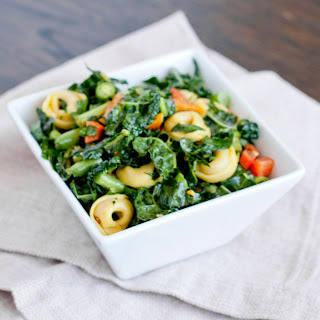 This is a kale salad but before I lose some of you, I want to warn you that this is a great intro to kale salad recipe. It's health food light thanks to some awesome ingredients. I'm not going to lie, unless kale is blended into my morning smoothie it's usually too aggressive a veggie for my pallet. It's so earthy and fibrous. BUT, this salad does such a great job of distracting you from all of that AND I have three tricks up my sleeve that really makes all the difference for any kale salad. Trick 1, chop that kale into thin, small shreds! It makes eating the salad a lot more enjoyable and it's so much easier to chew. Trick 2, dress your salad a few hours before you're going to eat it and up to 3 days before! Kale is an incredibly fibrous veggie and unlike lettuce, it won't wilt and get soggy once you put the dressing on it. In fact, the dressing helps break down the kale a bit. Trick 3, remove that thick vein that goes down the middle of the leaf. it's super fibrous and not very palatable. Now that I've set you up with the basics, lets get into it. In a large bowl, combine all ingredients and give it a few good stirs. Don't be afraid of the red pepper flakes. I thought for sure that one would get stuck in the back of my throat and have me coughing up a storm. Turns out they somehow melt and just add a nice depth of flavor, not crazy spiciness. Let sit in the refrigerator at least 2 hours or overnight. This will keep 3-4 days in the fridge. use seasonal veggies and veggies that you like. 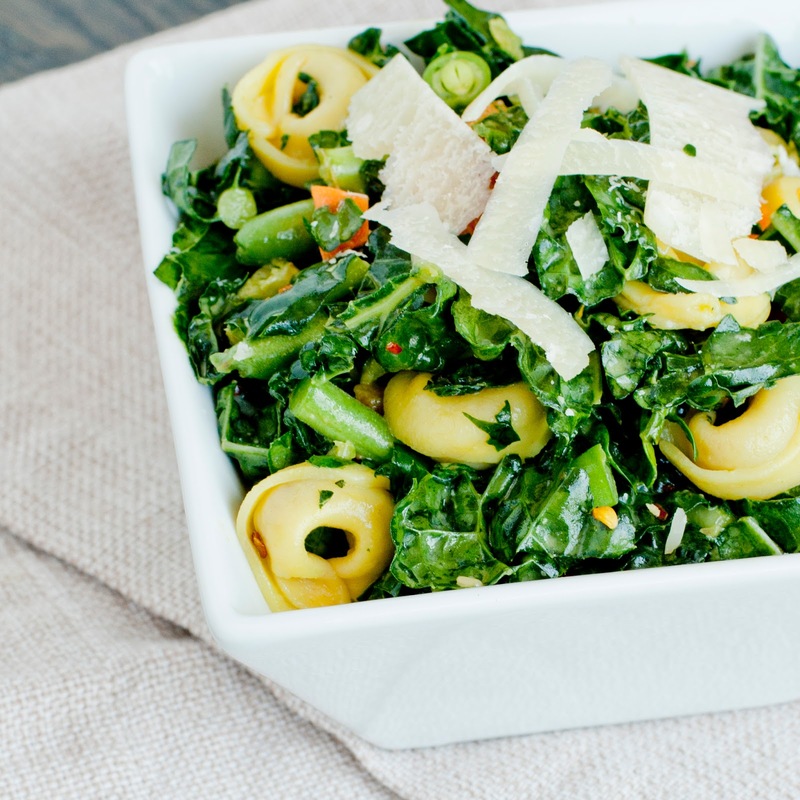 i love green beans cooked but the raw green beans in this salad really works. i'm telling you, my friend is magical - every ingredient just works. if you don't want to make your own dressing, you can use store bought. trader joes makes an awesome lime cilantro vinaigrette. green goddess dressing would be a good option too. whatever your favorite store bought dressing is should work. if you don't have tahini, don't go out buying it (unless you want to of course). i like the subtle creaminess it adds to the dish. it's easily left out. 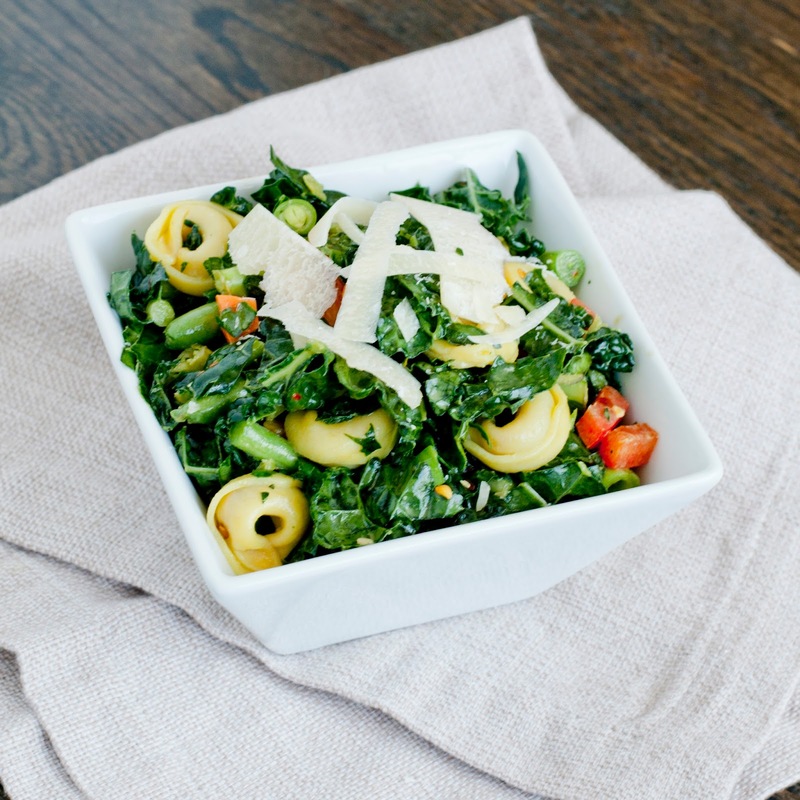 you can keep this dairy or gluten free by leaving out the pasta and cheese. the tortellini adds a nice texture - little bit creamy, little bit of that awesome pasta chew. the cheese adds a bit of a salty bite and helps tone down the earthy kale. if you're into kale salads, you can definitely leave these two out and go on with your bad self! my mouths all watery just by seeing the pictures of these tasty cocktails!! , these will surely taste great and I would hope to try it.thanks for the recipe .